← The Starbucks Sakura Frappuccino! The biggest difference between Japan and the US is of course the timing. The Japanese school year ends in March and begins in April, so many schools are currently wrapping up for the year and preparing for the next. Both of my schools have their graduation ceremonies （卒業式、そつぎょうしき） on March 1st, as does every public High School in Gunma Prefecture. It does feel a bit strange to have graduation on a Tuesday, however, and the 1st and 2nd years all have exams starting tomorrow. The next difference is that the students wear their school uniforms for the ceremony—no cap and gown for the graduating class! While I would be relieved not to have worn the ugly Hefty-bag style gowns we had to wear, there is something wonderful about flinging one’s cap in the air! The female teachers of the graduating class did wear traditional Hakama paired with colorful Kimono tops, the traditional Graduation wear hearkening back to the Meiji and Taisho eras. When education was institutionalized during the Meiji period, many girls took to wearing Hakama over their Kimonos to aid and speed their movement. It wasn’t until the Showa period in the 1920’s and 30’s that the Sailor style uniforms became widespread for girls, and some women still wear Hakama on very formal occasions such as graduations. I might try to wear Hakama next year, but for this year I just went with a suit, as I was reminded about 37 times that today would be formal. 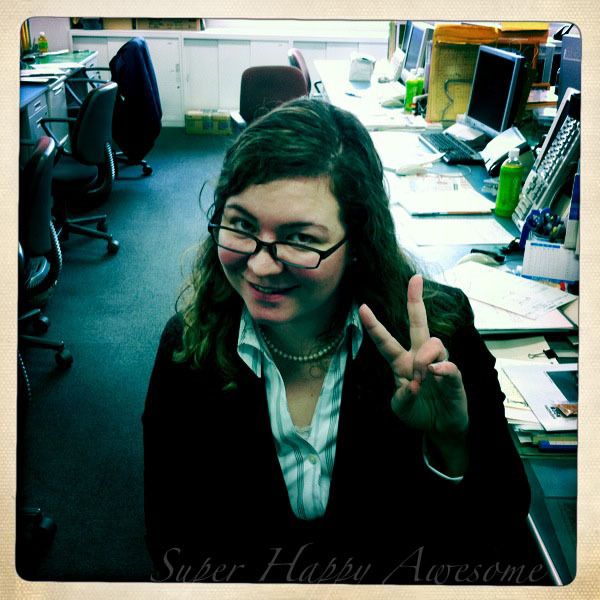 I am glad that I dressed it up a bit with my pearls, though! Another interesting difference was that at my school, the students were not handed individual diplomas. After processing in, formal roll was called for each class and then a representative for the entire grade received a diploma from the principle, with the rest to be distributed later. Then there were lots of boring speeches, just like in American graduations. (They might not have been so boring if I spoke more Japanese, but…) There were a few songs, as well—the school song, the National Anthem, and so on. Our school band is really excellent, so it’s always a pleasure to hear them play. During the speeches there were lots of complicated directions about when to sit, stand and bow for the various groups. For example, everyone stood and bowed for the principle’s speech, but only the students stood for the Student Body President’s speech. Only the Teachers and Parents stood for the last speech, though I wasn’t sure who she was—I think a parent, though the PTA President also gave a speech. It was all a bit confusing, and I’m glad that we spent most of yesterday practicing! At the end the teachers stood by the exit as the graduating students processed out. They hugged and shook hands with their favorite teachers, and many of the students were sniffling and crying. Most of the students I asked about graduation told me that they felt sad—3rd years told me that they were sad to be leaving, and 2nd years told me that they were sad to see their friends go. This one is obviously quite subjective, and I’m sure other students might have answered differently, but I mostly remember being happy and excited to graduate. I guess some people were crying, but I couldn’t wait to get out of there! What about in your school? Finally, the day ended in pretty much the same way as in American schools—taking pictures together, hugs, and tears. 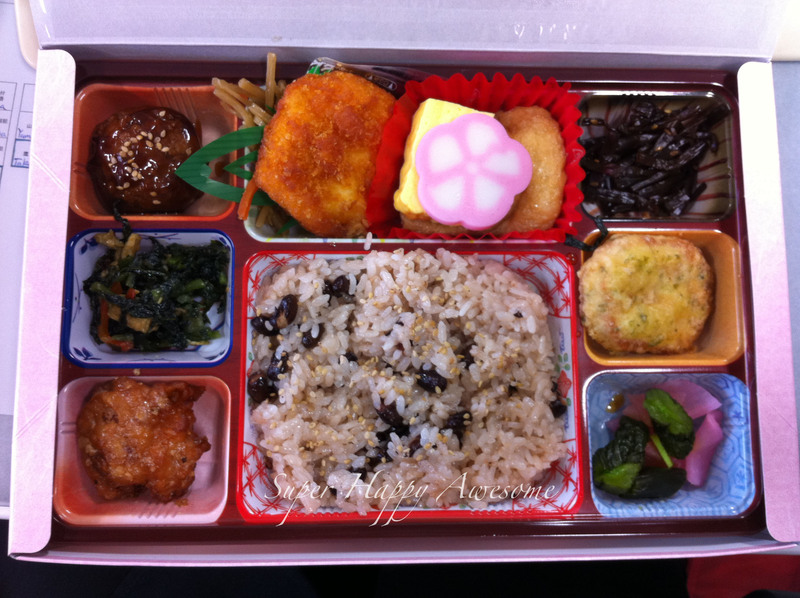 There were special bentos for the teachers, I think on behalf of the parents. I love the special day Bentos, which are always filled with tasty treats, and today’s was especially nice. Celebratory red-bean rice in the middle, and clockwise from left: kara-age fried chicken, spicy greens, a meatball, kinpira, fried chicken breast, sweet omelet, fish paste shaped like a flower, fried mochi wrapped in sweet tofu (my favorite! ), another strongly flavored veggie, a fried fish or maybe beef cake (yeah, a bit ambiguous) flavored with shiso, and finally pickles. It was a ton of food! Oh, and miso soup too, of course. Our school also had a number of news crews and journalists present to take pictures. This doesn’t happen at every school, but my school is quite famous for baseball, and one of the graduating students was actually recently drafted to play professionally–the number 1 Draft Pick, apparently. As a result, attendance at the graduation was apparently up this year, and everyone wanted their picture with the future star/hometown hero—even the teachers! I didn’t take a picture with him, but he seems like a sweet kid and is always polite and well-mannered. So that was my first Japanese Graduation Ceremony. The air was electric, and as the students walked out bawling it was easy to get caught up in their emotions and feel a bit choked up. And I don’t even teach any 3rd years! I’m sure next year when classes that I’ve taught and gotten to know graduate, I’ll be crying as well. And two years from now when my baby first years, the first grade I’ll have taught every class of graduates? Waterworks, for sure. What’s graduation like in your area? Similar, or different? This entry was posted in Modern Traditions and tagged bento, ceremony, formal, Graduation, hakama, Japanese, school, school life, students, tradition. Bookmark the permalink. 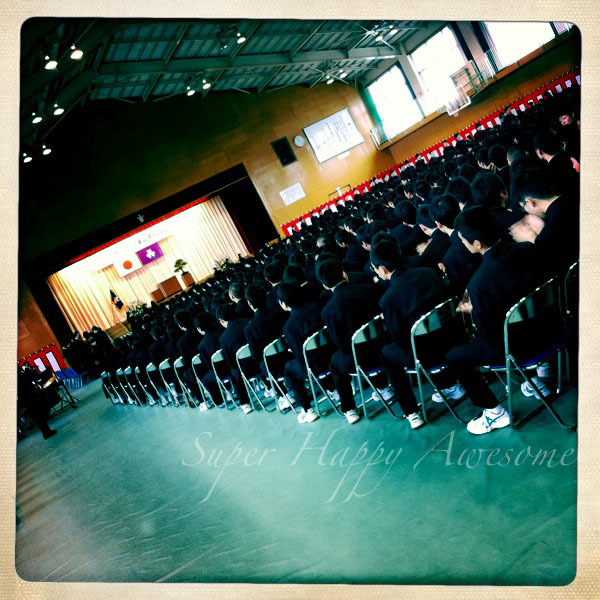 12 Responses to Graduation Ceremony! 卒業式! One of the ultimate compliments was when I received a uniform button from one of my hardest-working students. The tradition is to give the second button of your coat to someone you like, I believe, but there are plenty of buttons to provide! Dang, I remember my graduation. Dark maroon gowns under the boiling Virginia sun, too many speeches, waiting for over 400 kids to get their diplomas (and of course I was right near the end), afterwards taking pictures with my family, then my dad took my brother, boyfriend, and I out to Kobe’s, my special occassion restaurant. I think most of us graduates got our goodbyes out beforehand and weren’t too sad since most of us were staying in state anyways. Oh, and at the end, not so much cap throwing… beachballs, silly string, etc. It was awesome! That sounds like a ton of fun! We just did the traditional hats throwing, but silly string sounds way better, haha!